I posted up a live hunt Thursday night and someone asked for pics of my "arsenal"--so here it is. Rifle is a Winchester M70 Featherweight in .22-250 with a Leupold 3-9 Heavy Duplex reticle. Shoots lights out with 55-gr ballistic tips over 35.6 gr of H380 at 3550 fps. 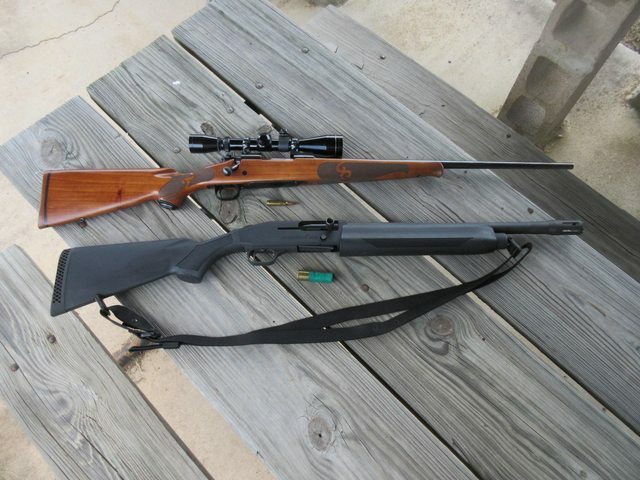 The scattergun is a Mossberg 930 12-ga. I also noted as I was putting the M70 back into its case that the rear scope mount moved--so good thing no hogs showed because I would most likely have missed. Went to the range today and re-zeroed and wasn't even on paper at 100. Bore sighted, shot at 25 yds, and then back to 100 and I'm on again. It was on my LGS wall as a consignment one day when I walked in---and it came home with me. I have no idea how many hogs it has accounted for over the years, and a few coyotes too.